For a long time I’ve wanted to bring old gardening and agricultural texts to a new audience. I collect old volumes myself and find them both charming and informative. I love the sense of other generations, in a time more grounded in farm and forest than most of us are today, showing the same love of and fascination with growing things that I have in my life. Unfortunately many of those old volumes are only available in limited quantities, for very high prices, and are often not in good shape for reading. So this will be a line of republished books from public domain texts, spiffed up for a new age, and available in inexpensive electronic formats. Where there is demand, I’ll offer print versions as well, but we’ll have to see how that develops over time. In all cases, the goal of the Farm and Garden line is to breathe new life into old classics. 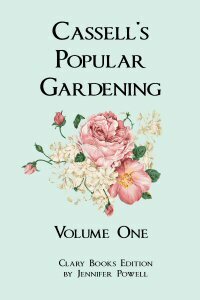 The 2011 Clary Books edition of Cassell’s Popular Gardening contains the complete text of the original, including illustrations, a hyper-linked Table of Contents, and a complete Index by subject area. Whether you are a new gardener or an old hand, you’ll find Cassell’s Popular Gardening both practical and entertaining. period, from drainage and digging, through greenhouse management, kitchen gardens, carpet bedding, garden design, and, to meet your special needs, sections on designing your carriage sweeps and the roadways on your country estate. Also chapters on roses, grapevines, mushrooms, cucumbers, and tons of other oddities. The original text has been carefully edited to be easy to read and free of typographical errors. While most archaic spellings were retained, some grammar and phrases have been updated for a modern audience. 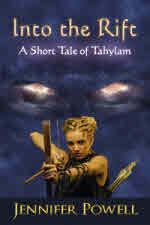 Illustrations have all been individually retouched to show perfectly on your e-reader. 292,000 words, approx. 800 pages. 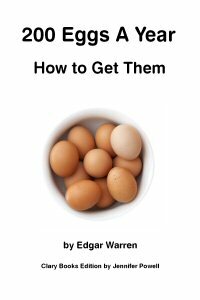 The 2011 Clary Books edition of Edgar Warren’s 200 Eggs A Year Per Hen contains the complete re-edited text of the original and includes illustrations, a hyperlinked Table of Contents, and Index. Whether you are raising chickens yourself or simply interested in the history of farming in America, you’ll find 200 Eggs Per Hen both practical and entertaining. Warren covers basic and advanced methods of raising poultry, including housing, nutrition, diseases, life stages, and reproduction. Earlier chapters contain a sprinkling of stories from people raising poultry back in the day which give the material a personal charm, while the final section Salad and Dressings includes random notes and a dash of humor. Some methods for handling diseases and parasites may have been superseded by modern methods but many are still usable, and Warren’s basic methods and theories of raising chickens are humane and sound. The original text has been carefully proofed to be easy to read and free of typographical errors. While most archaic spellings were retained, some grammar and wording has been updated for a modern audience. 37,000 words, approx. 110 pages.